Zamoyski's new book Napoleon. The Man Behind the Myth was published in the UK on 18 October 2018. It was published in Germany on 18 September 2018 under the title Napoleon. 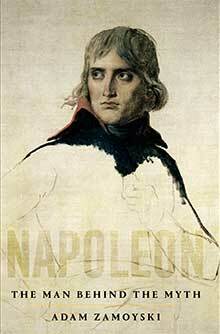 Ein Leben and also appeared in the USA that month, entitled Napoleon. A Life, as well as in the Netherlands under the title Napoleon. De man achter de mythe. The Polish edition will appear in early autumn 2019 and the French edition later in the year. 24 November 2018 : Der Spiegel has nominated the German edition, Napoleon. Ein Leben, 'History Book of the Year'. 10-12 May 2019 : giving talk at The Boswell Literary Festival at Dumfries House, Ayrshire. 18.30, 11 May : giving talk - 'Napoleon the Man Behind the Myth'. 10.30, 12 May : 'Does History Repeat Itself?' - discussion with Jonathan Fenby and Allan Little. 31 May 2019 : 'Napoleon as Cultural Phenomenon', giving talk at The Wallace Collection in London. 24 June 2019, 19.30 : 'Why Are We Still Talking About Napoleon : genius, liar, lover and chancer' - giving talk in the Tapestry Hall at Boughton House, near Kettering, Northamptonshire. 28 June 2019, 20.45 : giving talk at Chalke Valley History Festival near Salisbury, Wiltshire. 12 July 2019, evening : speaking at the opening session of symposium entitled 'Poles in Britain: History, Culture and Literature' at the University of Portsmouth. 26-29 September 2019 : speaking at the Marlborough Literature Festival in Wiltshire. 16 October 2019 : giving talk on 'Holy Madness' at Winchester College Studium event in Winchester, Hampshire. 3 March 2020 : giving talk to the Highgate Literary and Scientific Institution in London. 6 April 2019, 10.00am : 'Napoleon : The Man Behind the Myth' - talk at Oxford Literary Festival at Worcester College, Oxford. 4 April 2019 : 'Napoleon and Britain : a complex relationship' - talk to the Waterloo Association at the Cavalry and Guards Club in London. 26 March 2019, 19.00 : 'Why did Napoleon invade Russia in 1812?' - talk to the British-Lithuanian Society at the Lithuanian Embassy in London. 19 March 2019 : 'Napoleon : The Man Behind the Myth' - talk at the University of Groningen in Holland. 15 March 2019, 12.00 : in conversation with Richard Bassett about his new book 'Last Days in Old Europe : Trieste '79, Vienna '85, Prague '89' at Daunt Books, Marylebone HIgh Street, London. 9 March 2019 : panellist at the LSE Polish Economic Forum in London.